“I’ve been used to hauling water since I was eight years old. Today, at 63, I still do it,” says Antolín Soraire, a tall peasant farmer with a face ravaged by the sun who lives in Los Blancos, a town of a few dozen houses and wide dirt roads in the province of Salta, in northern Argentina. For about six months a year, between May and October, it does not rain. And in the southern hemisphere summer, temperatures can climb to 50 degrees Celsius. Most of the homes in the municipality of Rivadavia Banda Norte, where Los Blancos is located, and in neighbouring municipalities are scattered around rural areas, which are cut off and isolated when it rains. Half of the households cannot afford to meet their basic needs, according to official data, and access to water is still a privilege, especially since there are no rivers in the area. Drilling wells has rarely provided a solution. “The groundwater is salty and naturally contains arsenic. You have to go more than 450 meters deep to get good water,” Soraire told IPS during a visit to this town of about 1,100 people. 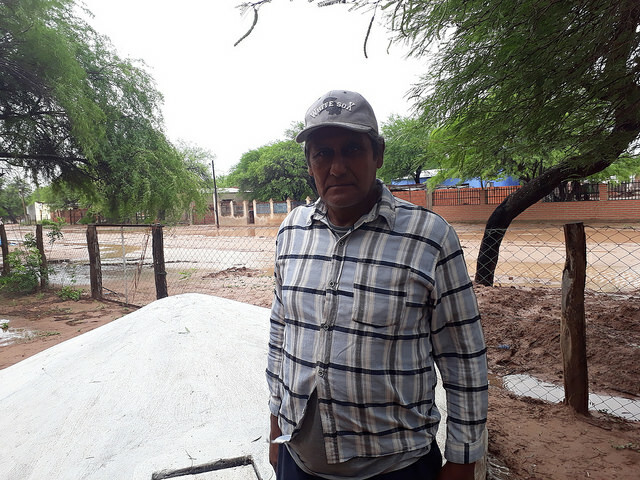 In the last three years, an innovative self-managed system has brought hope to many families in this area, one of the poorest in Argentina: the construction of rooftops made of rainwater collector sheets, which is piped into cement tanks buried in the ground. Each of these hermetically sealed tanks stores 16,000 litres of rainwater – what is needed by a family of five for drinking and cooking during the six-month dry season. “When I was a kid, the train would come once a week, bringing us water. Then the train stopped coming and things got really difficult,” recalls Soraire, who is what is known here as a criollo: a descendant of the white men and women who came to the Argentine Chaco since the late 19th century in search of land to raise their animals, following the military expeditions that subjugated the indigenous people of the region. Today, although many years have passed and the criollos and indigenous people in most cases live in the same poverty, there is still latent tension with the native people who live in isolated rural communities such as Los Blancos or in the slums ringing the larger towns and cities. Since the early 20th century, the railway mentioned by Soraire linked the 700 kilometres separating the cities of Formosa and Embarcación, and was practically the only means of communication in this area of the Chaco, which until just 10 years ago had no paved roads. The trains stopped coming to this area in the 1990s, during the wave of privatisations and spending cuts imposed by neoliberal President Carlos Menem (1989-1999). Although there have been promises to get the trains running again, in the Chaco villages of Salta today there are only a few memories of the railway: overgrown tracks and rundown brick railway stations that for years have housed homeless families. Soraire, who raises cows, pigs and goats, is part of one of six teams – three criollo and three indigenous – that the Foundation for Development in Peace and Justice (Fundapaz) trained to build rainwater tanks in the area around Los Blancos. “It’s very important for the family to work hard for this. In order for this to work out well, it is essential for the beneficiaries to feel they are involved,” Seghezzo told IPS in Salta, the provincial capital. Fundapaz “imported” the rainwater tank system from Brazil, thanks to its many contacts with social organisations in that country, especially groups working for solutions to the chronic drought in the Northeast region. Romero points out that so far some 40 rooftops and water tanks have been built – at a cost of about 1,000 dollars each – in the municipality of Rivadavia Banda Norte, which is 12,000 square kilometres in size and has some 10,000 inhabitants. This number of tanks is, of course, a very small part of what is needed, he added. “I wish the entire Chaco region could be sown with water tanks and we wouldn’t have to cry about the lack of water anymore. We don’t want 500-meter deep wells or other large projects. We trust local solutions,” says Romero, who studied environmental engineering at the National University of Salta and moved several years ago to Morillo, the capital of the municipality, 1,600 kilometres north of Buenos Aires. On National Route 81, the only paved road in the area, it is advisable to travel slowly: as there are no fences, pigs, goats, chickens and other animals raised by indigenous and criollo families constantly wander across the road. Near the road, in the mountains, live indigenous communities, such as those known as Lote 6 and Lote 8, which occupy former public land now recognised as belonging to members of the Wichí ethnic group, one of the largest native communities in Argentina, made up of around 51,000 people, according to official figures that are considered an under-registration. 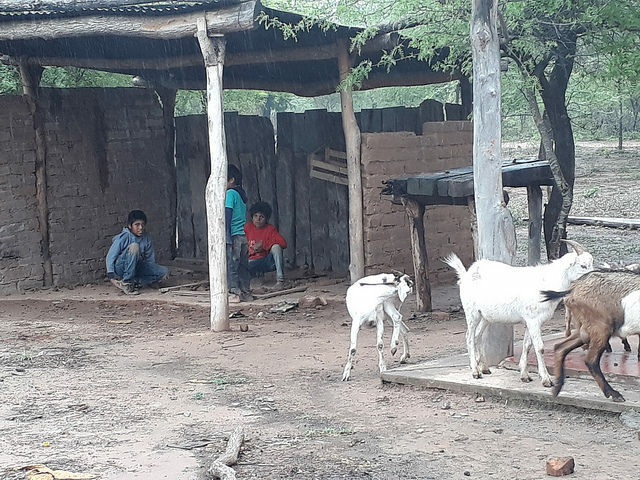 In Lote 6, Dorita, a mother of seven, lives with her husband Mariano Barraza in a brick house with a tin roof, surrounded by free-ranging goats and chickens. The children and their families return seasonally from Los Blancos, where the grandchildren go to school, which like transportation is not available in the community. About 100 metres from the house, Dorita, who preferred not to give her last name, shows IPS a small pond with greenish water. In the region of Salta families dig these “represas” to store rainwater. The families of Lot 6 today have a rooftop that collects rainwater and storage tank, but they used to use water from the “represas” – the same water that the animals drank, and often soiled. “The kids get sick. 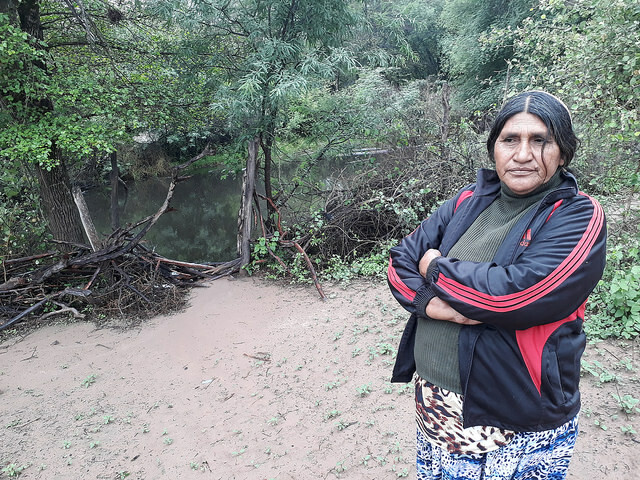 But the families often consume the contaminated water from the ‘represas’ because they have no alternative,” Silvia Reynoso, a Catholic nun who works for Fundapaz in the area, told IPS. What Montes doesn’t say is that water in the Chaco has also been used to buy political support in a patronage-based system. 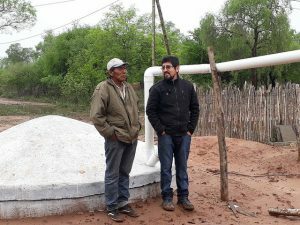 “Water scarcity is the most serious social problem in this part of the Chaco,” says Bertea, who maintains that rainwater collection also has its limits and is experimenting with the purchase of Mexican pumps to extract groundwater when it can be found at a reasonable depth. “The incredible thing about all this is that the Chaco is not the Sahara desert. There is water, but the big question is how to access it,” he says.